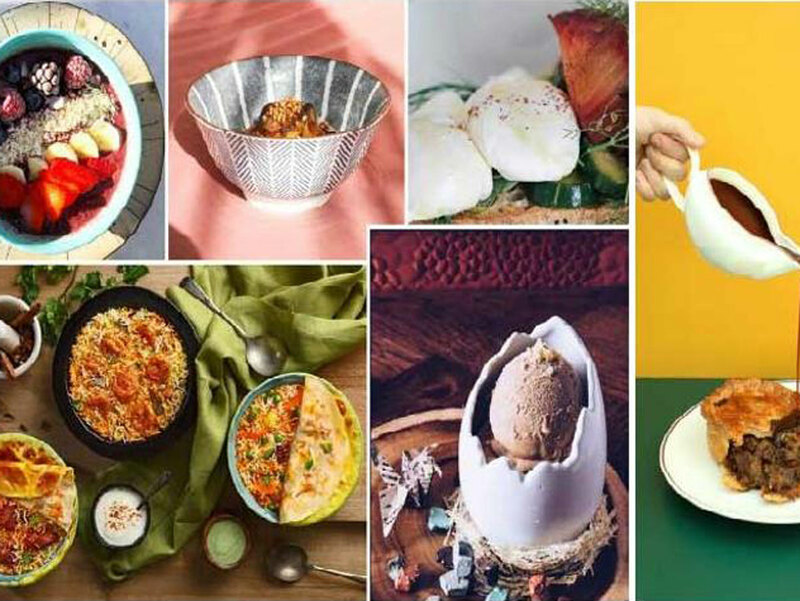 The UAE food scene is not new to restaurant openings, but the year end has brought a series of exciting names that are worth a mention. Oni is a new lively dining spot serving Japanese cuisine at the Shangri-La Hotel on Sheikh Zayed Road. The menu is made up of Japanese street food where the dishes served in sharing style plates. Using ingredients sourced from Japan’s north Island of Hokkaido, the food is flavourful. I tried almost the entire tasting menu, which included robata (grilled fish, meat and chicken skewers) sushi rolls, pan fried gyoza and beef ramen. Other menu highlights include wagyu beef tataki, avocado on crispy rice, tuna pizza, seafood okonomiyaki, and semi-dried Japanese rockfish. My favorite was the beef ramen. It is really good in comparison to the young (but flourishing) ramen availability in the city. I would go also go back for the salmon tacos. The design is dramatic and the interiors are very luxe, so you go there when you’re dressed up or looking for a fancy ‘Dubai’ night out. The music is great, without being too loud. Follow the red neon lights of the Chinese dragon to Fat Chow, one of the new dining spots to hit The Pointe at Palm Jumeirah. Now open for business, Fat Chow serves Cantonese cuisine with sea views. It has like a cool, dark Hong Kong vibeIf you’re into like a goth neon decor, you’d enjoy having dinner there. Classic Fat Chow dishes include Peking duck, Cantonese style steamed chicken, chili crab, wok-fried XO prawns and hammour cooked with ginger and spring onions. There’s also a fun, sharing menu featuring bites, soups, dim sum and bao, as well as noodles and desserts. The dim sum was my favourite part of dinner there, I finished every last one of them. Mama Pho’s mottos is: Vietnamese and Thai food, straight from Mama’s kitchen and it kind of feels that way. The vibe is rustic the furniture is wooden and the view is of the sea. It’s a nice spot for a laid-back midweek bite. Little bit quiet on the weekends though. Mama Pho’s menu includes good, honest pho, (I meaannn it’s in the name!) with two options available; Vietnamese noodle soup and tom yum goong. Other must-try dishes include the lobster wonton, Thai green papaya salad (always a crowd pleaser), Vietnamese noodle soup, the aromatic lychee duck and delicate ginger lotus seabass. Bear in mind that the mains are a bit on the pricy side, as this venue is licensed, and you have to order steamed rice separately, which does add up. Okay hear me out. It’s a fine dining restaurant in an era where people are somewhat over fine dining. But it is a Two Michelin Starred chef who opened this venue, so you have to give it the benefit of the doubt. Chef Mathieu Viannay the culinary mastermind behind La Mere Brazier in Lyon, France recently opened Rue Royale, an unlicensed dining experience at The Pointe in Palm Jumeirah. Rue Royale has taken its fancy name from the street in Lyon where La Mère Brazier is located. This restaurant is expensive. Mains range from Dh150 to Dh300 and the appetisers are around Dh90. But the food is creative, flavourful and you really feel like you’re dining a Michelin level meal. Order the Pate en croute, one of the famous dishes at his Lyon establishment. Also try the scallops with a butter lemon confit and the sea bass with mussels. If you want to dine there without spending an arm and a leg, head over there for breakfast, which should cost you less than Dh80 per person. ‘Mango Tree Thai Bistro’ is a newly opened Thai spot. The menu features dishes from the four regions of Thailand, but they also have the familiar items that people here can identify and enjoy. When you dine there, expect traditional dishes like the watermelon salad with hand grinded dry shrimps floss, and also very trendy and somewhat unknown plates like the som tam corn salad. The menu also features other signature dishes such as spicy beef short ribs soup, jungle curry from the mountainous regions, and massaman leg of lamb inspired from the south of Thailand. Some of the dishes come with hearty portions, while others are smaller portions, so scroll through their Instagram to get an idea of what to order depending on your level of hunger. It’s a family friendly spot in the heart of crowded JBR. Located in one of Dubai’s most creative locations, Cassette will opens its doors in February in The Courtyard, Al Quoz. The cafe is built out of recycled and repurposed materials. Very eco friendly. The re-imagined bistro takes French cuisine and puts an international spin on it. Introducing what the team like to call a “Modern Parisian Direction.” From healthy dishes to small bites and crave-able comfort foods, Cassette has something to offer for everyone, whether its breakfast, lunch or dinner – Not to mention their artisanal coffee, wellness range of tea and variety of homemade juices and seasonal drinks. Cassette will also introduce guests to a unique selection of music, with an interactive corner where they can listen to and buy limited edition vinyl's. Snowboarder-turned-chef brings the adventure to the plate with Akira Back, the upcoming Asian fine-dining restaurant at The W Hotel, The Palm Jumeirah. Chef Back, who has nearly 25 years of culinary experience and a number of namesake restaurants across the globe, brings his take on modern Japanese cuisine to the Middle East. His Korean heritage and his American upbringing also finds a dollop of seasoning on the palette. Chef Vineet Bhatia is not a new name of the Dubai food scene, with his contemporary Indian restaurant, Indego at the Grosvenor House, already a firm favourite among patrons. The Michelin-starred chef will has brought a fresh new concept to Dubai with the launch of Indya by Vineet at Le Royal Meridien Beach Resort & Spa. The restaurant takes a contemporary approach to Indian street staples featuring famous dishes from all around the different states of India. The new venue has an outdoor terrace as well. With locations in London and Melbourne, this will be the third outpost of the culinary concept developed by the Michelin-star chef, who will work alongside his chef-director Ashley Palmer-Watts on the Dubai opening. The restaurant will include its own bar, two outside terraces, as well as a private dining room. The restaurant will offer contemporary flavours of British dishes inspired by recipes dating back to the 1300s, which itself stems from Blumenthal’s fascination with history and gastronomy triggered in the late ‘90s after reading a 15-century manuscript known as The Vivendier. Incidentally, the new property will also be home to another future hotspot — a popular Iranian–American celebrity TV chef and author, Ariana’s Persian Kitchen. When: No confirmed opening date as yet. Located in the upcoming Mandarin Oriental Jumeira, Dubai, Tasca is a new restaurant by culinary genius Jose Avillez. Named after the Portuguese word for tavern, Tasca will be Avillez’s first international opening, aiming to follow the success of his Michelin-starred Lisbon eatery, Belcanto. Located on Beach Road, the poolside restaurant will serve authentic Portuguese cuisine with a contemporary twist, with both indoor and outdoor dining. Le Royal Meridien Beach Resort & Spas' latest culinary offering, has now opened its doors to D diners. The concept brings a taste of Italy to the heart of Dubai Marina. The earthy interiors, wooden flooring, suspended lighting, marble table tops and neutral textiles make for an Instagram-able location. La Strega promises uncomplicated, authentic Italian food such as Spaghetti Lobster as well as more regional interpretations of Ravioli Burrata with cherry tomato sauce. Diners can also indulge in a selection of antipasti, octopus, mussels, burrata as well as steak and fish served straight from the grill. All’Onda is a blend of Asian and Italian cuisine. The menu will include a selection of seafood, homemade pasta and risottos and Venetian chicchetti, as well as an extensive grape list sourced from the Northern regions of Italy. Dishes includes Buffalo Ricotta Ravioli with Vine Tomato Sauce and Basil, Peppered Beef Tagliata with soft Burrata and a herby Pangrattato Indian Osso Buco with Saffron Risotto and Risotto All’Onda, made with Madras Curry, Prawns and Shiso. The All’Onda restaurant has a sleek design throughout, reflecting its Venetian heritage, and covers the entire top floor of the Kempinski Emerald Palace Hotel. Popular Indian restaurant chain Copper Chimney, which first opened its doors in 1972, has seen many a celebrity walk through its doors over the decades. Well known for its flavourful kebabs and the artistry that unfolds in its tandoor clay ovens, Copper Chimney has recently found its way to the Millennium Plaza Hotel. The restaurants signature grills include the reshmi malai chicken and the kalimirch chicken, both heavily influenced by the flavours found in old Delhi, along with the wafer-thin kadak rumali and the paneer tikka, which is marinated more than eight hours. If the selection of grills aren’t enough, there are eight types or birianis to choose from — even one to keep the vegetarians happy. Opening to the public just last week, Kizmet serves what it calls a modern take on soul food, which is inspired by dishes its staff grew up with. Dishes on the menu include small plates called ‘My Girlfriend Is Not Hungry’, which is nothing but a serving of avocado fries with habanero mayo.The restaurant also has a social working space for those looking for a change of scene from their office. Where: Downtown Dubai, next to Dubai Opera. The recently opened Stoke House Dining, Bar & Terrace, located at the Damac Hills estate, overlooks a lush golf garden that makes for a convenient luncheon spot following the morning tee time. The menu varies, but hits all the right buttons with signature steaks, classic burgers, fresh seafood delicacy and salads. The terrace area serves as the ideal alfresco dining spot as the weather cools down and features BBQ evenings and pasta nights with live cooking under a massive spinning Parmesan wheel. The Duck Hook offers classic “pub grub meets modern European fare”. The idyllic hideaway allows for uninterrupted views of Dubai’s city offers a range of starters or snacks, including duck scotch egg, shrimp tempura; chicken tikka bites and more. Main courses include beef Wellington for two; braised and roasted Welsh lamb shank; battered fish and chips; duck confit or a steak pie. There’s also tasty chicken ruby curry and a vegan Portobello mushroom or beef, burger. The best part is, the Duck Hook offers free flowing filtered water. Initiated by three Emirati sisters whose passion and love for food was passed on from their mother; “Asma” is set to open its doors end of December in Dubai Mall. The new dining places a contemporary twist on Middle Eastern cuisine, bringing flavours of Lebanon, Jordan, Palestine, Egypt and Syria to food lovers.